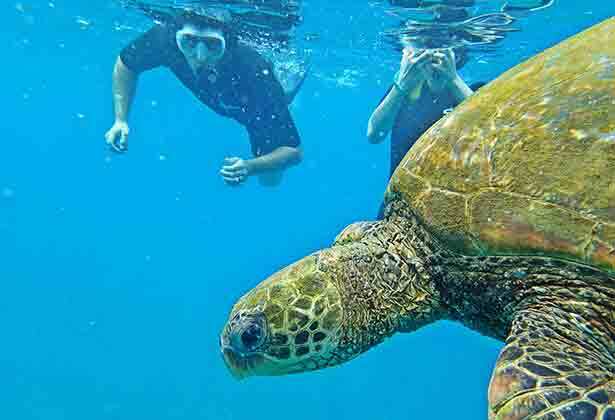 Looking to have an epic, awe-inspiring maui snorkeling adventure? Then you’ve come to the right place. Welcome to Redline Rafting! We offer a thrilling, eco-friendly, culturally conscious experience. Ride in, and snorkel from, our 35 ft. customized raft. We‘ll ’talk story’... tell old Hawaiian tales, give you a little Hawaiian history, interesting geological info, reef and creature facts, and oh, the rules of course! We have a max capacity of 24 which allows us to be more maneuverable so we stay away from the crowds and spend more time up close and personal with mother nature. 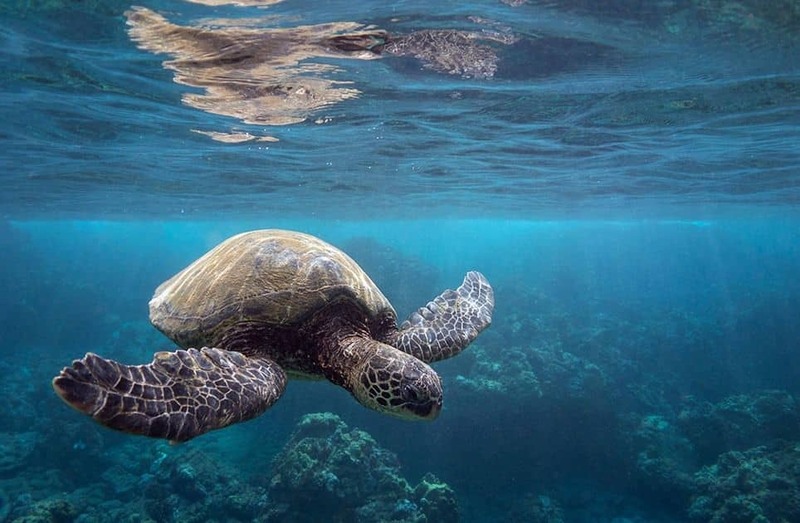 On all our Maui snorkeling tours we stop at the more remote spots, in addition to the more popular ones, which gives you a less-crowded, more personalized experience. Now, isn’t this what it’s all about? We like the idea of having a nice stretch of reef that’s teeming with diverse sea life all to snorkel ourselves, don’t you? 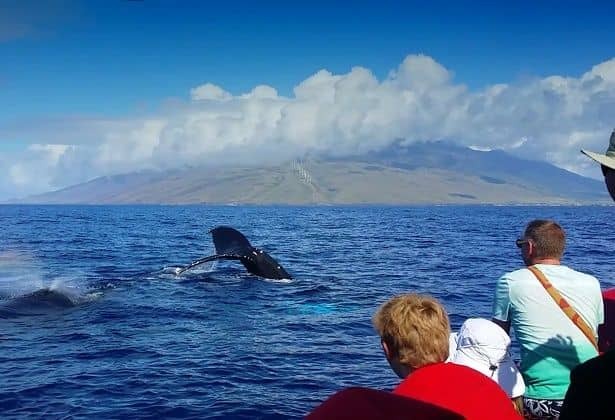 Redline takes great pride in giving you an extraordinary Maui adventure you’ll be reminiscing about for years to come. 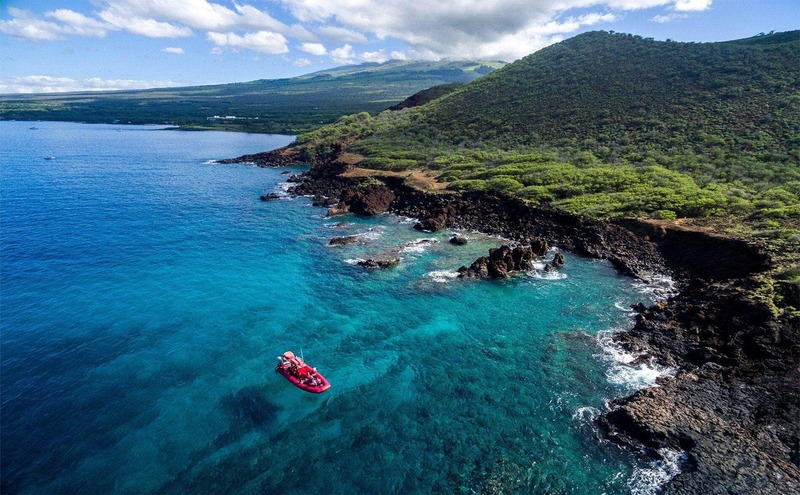 Of all the things to do in Kihei, going out rafting with us should be number #1 on your list. Explore the incredible beauty of Wailea and Makena from off-shore and you’ll see why celebrities flock to these oceanfront locations. All our tours leave from the Kihei Small Boat Harbor in South Kihei which has plenty of free parking. Our convenient location allows anyone staying in the condos or hotels in Kihei, Kahului, Wailuku, Wailea or Makena just a little bit more time to sleep in. 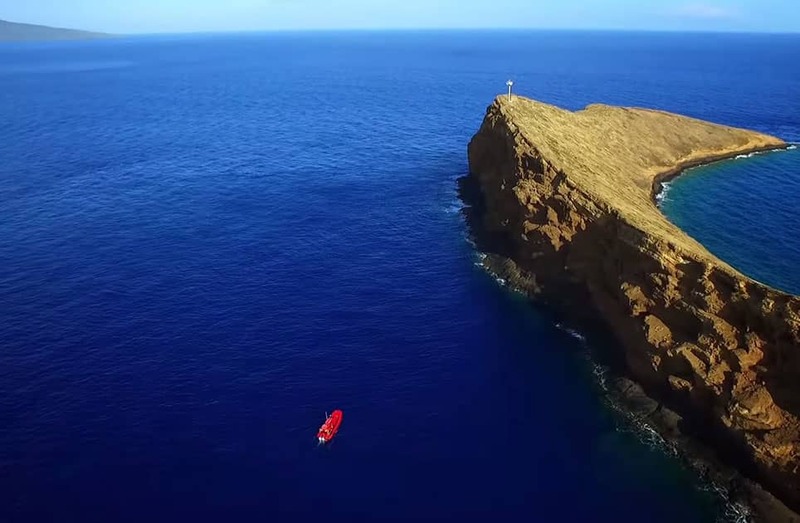 Redline’s Forbidden Coast & Molokini Snorkeling Tour, explores Maui’s more remote locations. The backside of Molokini (a very pristine environment) and La Perouse Bay’s playful, curious spinner dolphins, are two favorites. We frequent Maui’s best sites (think caves, lava arches, and grottos) – but not always the most popular! Our comfortable and agile ocean rafts will get you there quickly so you can snorkel longer and see more. And, our max capacity is 24, so it’s ‘ciao’ to the crowds! Breakfast, lunch, wetsuits, snorkeling gear, (plus juice, water, and soda all day) are included (FYI: Alcohol is taboo due to the adventure factor). And yes, there’s a bathroom on board! 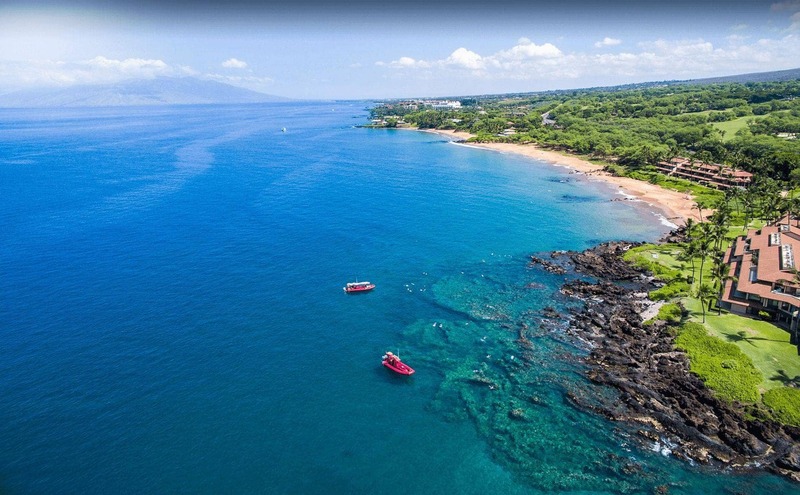 Our ideal and advantageous location allows guests staying in hotels or condos in Kihei, Kahului, Wailuku, Wailea or Makena a little more time to catch some z’s before embarking on a one-of-a-kind adventure. And once we’re all boarded, we’re just a quick 10 minutes to Maui’s most premier snorkeling at Molokini. 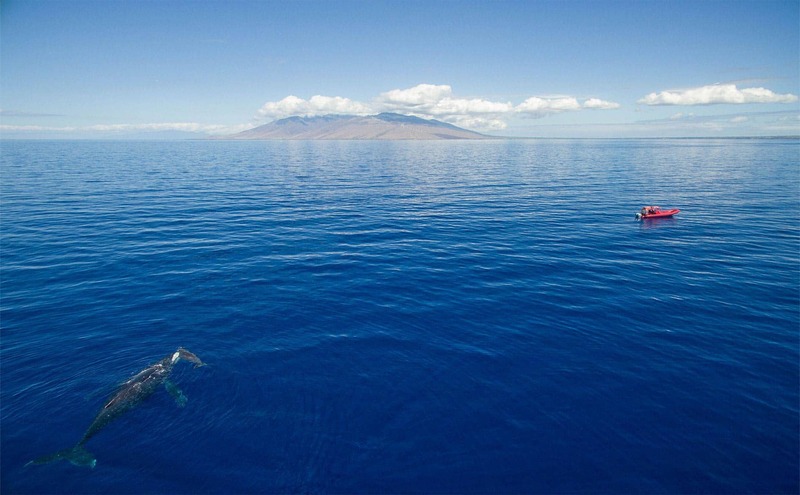 Something special happens in the waters surrounding Maui between December and April. North Pacific humpback whales come to mate and have their calves in Hawaii’s warm, protected waters. Redline Rafts are extremely maneuverable and can carry a maximum of 24 passengers so there’s a good view from every seat! Celebrating a special occasion? Why not take your loved ones, friends or business associates on a top-of-the line 35 ft. raft for a customized snorkeling or whale watching excursion? 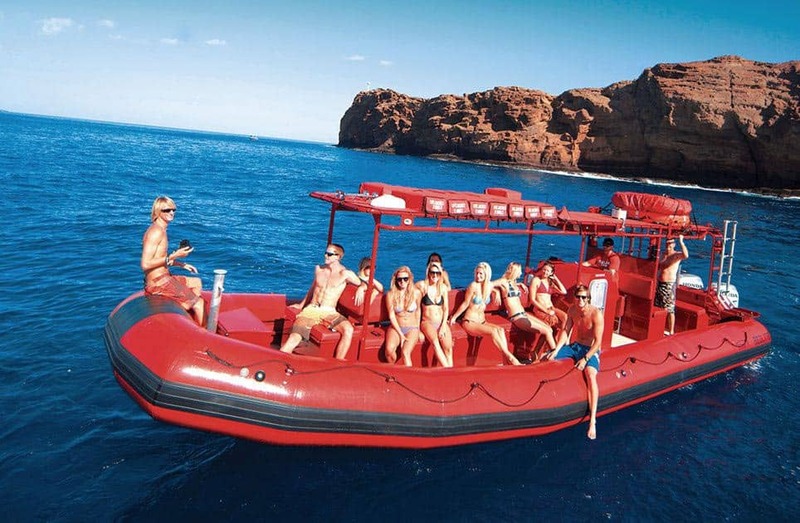 Chartering a private Redline raft is a memorable way to celebrate any occasion! Name your heart’s aquatic desires and we’ll take you there…with ‘Aloha‘. Our agile rafts get you and your party where you want to be quickly and safely so you can enjoy every minute of being there, instead of being “on your way” there. Explore your itinerary at your pace on our private sightseeing and snorkel adventures. Our highly trained captains and crew members are here to serve you. This is a great snorkeling trip. There were four dives, each in a unique area with two that were devoid of other groups. They also stopped in a couple of places to give history & perspective on what we were seeing. They are very organized and concerned about your safety. Kiki & Chase were our guides and were fantastic. The whole trip was wonderful. We thoroughly enjoyed this professionally-led and organized trip. Kiki and Chase were very pleasant and informative about the lava formations of the islands as well as the ocean life we saw at each of our 4 stops, including La Perouse Bay which was the BEST. Very comfortable boat too. We highly recommend this snorkeling adventure. What an awesome time!! The best snorkeling trip ever! This is the way to do it! Definitely the highlight of our Maui trip! We saw whales, turtles, a baby shark, eels and tons of beautiful fish. Alex & Kiki were awesome too! Mahalo! See you next time! 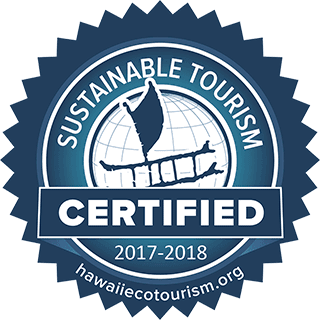 I have over 3000 hours snorkeling premier sites around the equator and this humble rafting company delighted me with excellent in water walls and abundant fish populations abutting Molokini plus we saw whales as well. Very well managed outfit.